This plan has been written to guide the Thelma Smiley Morris Elementary School administrators and faculty through most disasters. This plan is not all-inclusive and it is not a substitute for sound judgment. All T.S. Morris School administrators and faculty are encouraged to read and review this plan often. Any suggestions as to how this plan can be improved should be addressed to the school Crisis Management Team. The T.S. Morris Elementary School Crisis Management Plan is reviewed and updated as needed annually. All students, parents, teachers, administrators and guests evacuate the building upon the signaling of the fire alarm. All classrooms and areas follow a designated route for fire evacuation. In the event their route becomes inaccessible, teachers are aware of alternate escape routes.Students remain with their teachers and an accurate report is made of all students and adults known to be present. 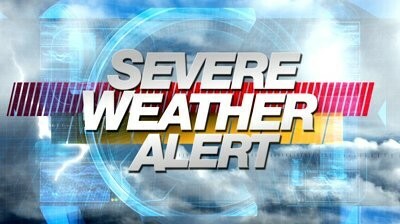 Should inclement weather arise, a procedure has been planned and practiced to insure the safety of students and adults. Each homeroom is assigned to a safe area, and when the weather alarm sounds teachers and students move to their designated area. The principal and resource teachers circulate throughout the building to assist where needed and account for student and teacher locations. Announcements will be made to appropriate school personnel as notification of impending weather conditions. Office personnel will monitor the emergency communications equipment and local radio stations while continuing with regular school activities. The principal should be notified immediately who will in turn notify the police and school security. The principal will also notify the Superintendent’s office. The school should be evacuated using a predetermined fire drill signal and evacuation plan. Teachers should carry their emergency packet with them. Police and other emergency response agencies should be notified. The decision as to whether to resume classes or dismiss school will be made by the Superintendent following an evaluation of the situation by all authorities. In the case of a suspected mail bomb, the envelope or package should not be handled unnecessarily. The immediate area should be evacuated and secured to prevent re-entry. The proper authorities should be notified. In the event that a shooting takes place on the school campus, lock down procedures will be implemented and the principal or designee should call 911 immediately. All those present, will stay in lock down until emergency officials and law enforcement arrives and takes over the situation. The Incident Command Team should perform roles and duties. 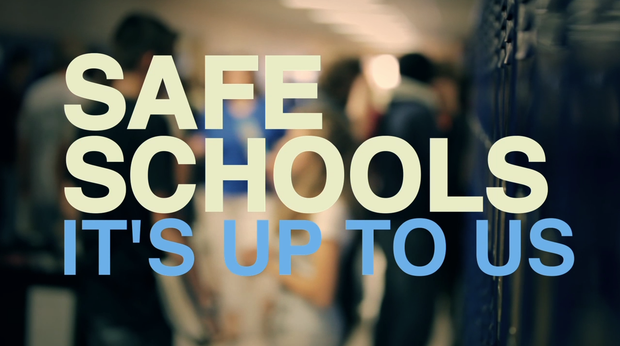 Certain emergency situations facilitate the need for students to stay in one safe location. A lockdown drill will occur twice during the school year. If it should become necessary to keep students and staff in one location for their safety the following procedures will be used. The Principal or a designee will make an announcement stating the situation or circumstance. This is the signal for teachers to take safety precautions. The classroom door should be locked, and the students who are out of the regular classroom need to be kept where they are. Students in transit should go to the nearest classroom. Teachers and staff should be aware of students who may be in hallways in order to get them to the nearest classroom. 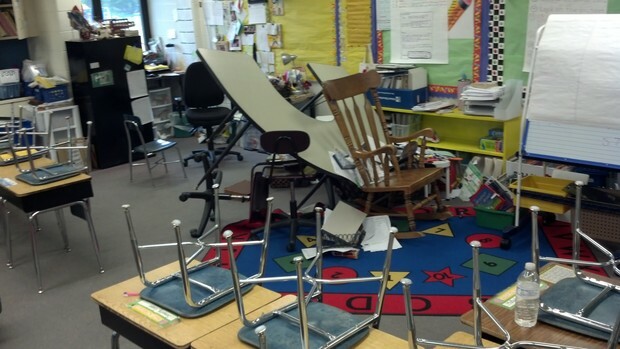 Teachers should be aware of the need to remain as calm as possible so the students can also remain calm. Students and teachers who are at P.E. or recess will have a radio that allows them to communicate with the office. In the event of a lockdown, the office will also make contact with those on the playgrounds using the radios. The principal based on the situation at hand will decide a plan of action for shelter. If a class is in the Cafetorium, they will report to the Media Center. For the safety of all students and staff, exterior doors are kept locked except the doors to the main entrance of the building. The exterior doors will allow people to exit without a key, but will require a key to re-enter. Exterior doors should not be propped open when a class is on the playground. All teachers should keep their school keys with them at all times to re-enter the building. Every effort should be made to observe this regulation for the safety of our students and faculty/staff. Employees should always be aware of circumstances and recognize that a problem could develop at any time. In the event that a person or persons enter the building and threaten to harm students, faculty and/or staff, the first priority must be the safety of the students and faculty and staff. All visitors should have a visitor's badge. If a school employee notices a stranger without a badge, the employee should ask if the stranger needs assistance. If possible direct them to school office. If the unauthorized person refuses, communicate with the office as to the location and identity of the stranger. If the unauthorized person is hostile or threatening, call the school office for assistance. The school office should contact law enforcement officials or assistance by using 9+911. Specific details such as number of people involved, weapons, location, place of entry into the building, general description of people involved and vehicle should be provided. The Superintendent's office should be notified after the police. · The school office personnel should call 911. · The principal and the police will insure that the family is notified. · The school personnel will contact Central Office. All steps must be documented in writing. 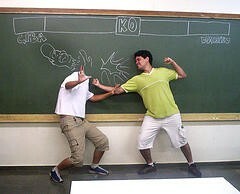 If students engage in a fight or other physical disturbance, administration should be notified immediately. Administration will investigate the occurrence and contact those pertinent to the information. If misbehavior is not serious then have students return to their normal school routine. If the behavior is serious then notify appropriate authorities, 911 if necessary and the Central Office. Notify the parents at an appropriate time. Should an individual become irate, he/she should be contained in one location and the administration should be notified immediately. The principal/assistant principal should try to calm the individual. If the principal is unsuccessful, appropriate authorities will be notified. If necessary, lockdown procedures should be followed to protect students and teachers. Tyler Perry's Madea Goes to Jail - 15. "Call the Police"
· Registration forms will list who may/may not pick up or check out a child. · The staff working with the children who have restricted pick up or check out will be notified of such restrictions. · The staff will be notified of any threatening situation dealing with a child with whom they work. · The teacher or staff member should notify the school office and provide a description of the student and as much as possible about the incident. · The school office personnel may call 911 if necessary. · Efforts should be made to contact the runaway and bring him/her back to school. Activate the Incident Command System if necessary. · School office personnel should contact the parent or guardian. · School personnel should contact Central Office. All communication to the public will come from the administration. · A description of student's clothing worn that day and a picture of the student should be available for law enforcement personnel. Check with teachers to obtain clothing description. Pictures may be available from files or yearbooks, but a picture of every student should be available. · All steps must be documented in writing. The office (principal or secretary) will notify the central office (334-223-6700) and the police (9-911). A list of any missing items should be made and presented to the office. The appropriate staff should be available to assist in providing information. Communication to the public regarding the break-in/burglary will be provided through the administration. Communication of the event to the students should be discreet so as not to jeopardize the investigation. In the event of an emergency closing of school, the established procedure will be followed. 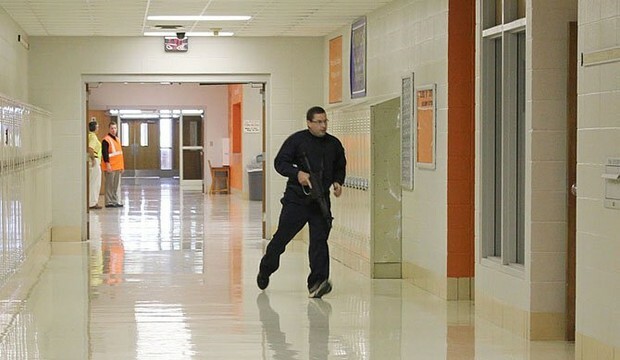 Certain emergency situations facilitate the need for students to stay in one safe location. 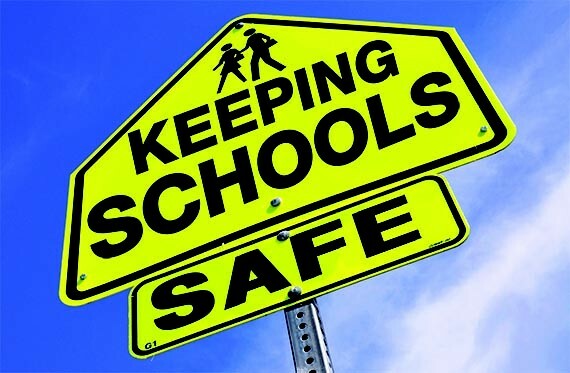 It if should become necessary to keep students and staff in one location for their safety the following procedures will be used. The office will make an announcement regarding the situation. This is the signal for teachers to take safety precautions. If time permits, the classroom door should be locked, and the students who are out of the regular classroom need to be kept where they are. Students in transit should go to the nearest classroom. Teachers and staff should be aware of students who may be in hallways in order to get them to the nearest classroom. Teachers should be well schooled in the need to remain calm so that the students don't become unduly alarmed. An adult should take any students outside of the building to the nearest public building. Support personnel should go to the nearest classroom. Staff members are assigned to check the restrooms. If a student is found there, the staff member should take the student to the staff member's room or nearest available room. 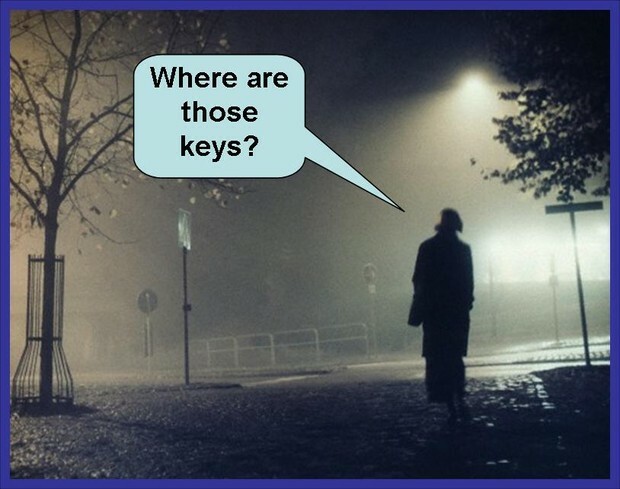 Teachers and staff it is very important to have keys on you at all times. 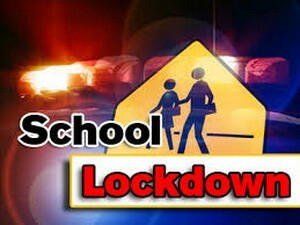 Do not allow students to have classroom keys in their possession in the event that lockdown procedures are necessary. Furthermore, classrooms keys need to be accessible in case there is an intruder in the building.